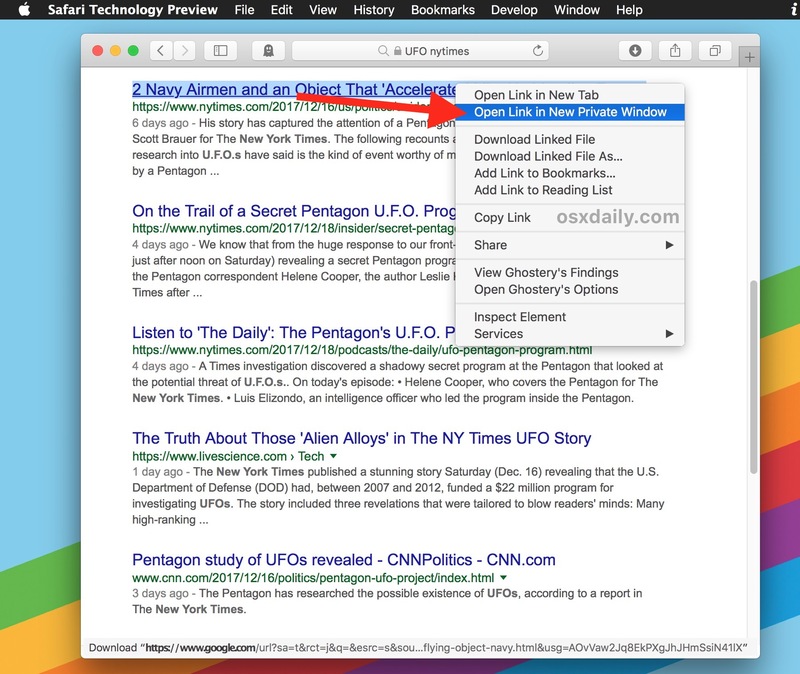 You can easily open any link found on the web into a new private browsing window on Safari for Mac, thanks to a helpful albeit little-known trick available in the web browser. For the unfamiliar, Private Browsing mode aims to protect private information and some degree of privacy by preventing websites from tracking search behavior, setting permanent cookies, and insuring that pages and websites you visit are not stored in typical Safari History. This is helpful for many situations, let’s say you see a link on a webpage that you want to open but you don’t want it to appear in your browsing history for whatever reason (or avoid the cookie situation because of a paywall), then you could open a link into the private browsing window. You can try it out yourself quickly with this very article, just hold down the OPTION / ALT key on the Mac keyboard, then right-click on a link to a website like this for osxdaily.com and choose “Open in New Private Window”. You must have a modern version of Safari to have this capability available to you. If your Safari version is outdated, you could use Safari Tech Preview instead, or just open a new private browsing window the regular way and then navigate to the link in question. And yes, that means this trick works with open new private browsing windows in Safari on Mac OS anytime you’d like with a keystroke (command+shift+N) or by going to the File menu (New Private Window), but being able to open a new link directly into private browsing mode is a nice feature to come to Safari on the Mac. Chrome for Mac also supports this feature, but you don’t need to hold down any particular keystroke to access it, just a simple right-click or control+click will offer the same option in the pop-up menu of Chrome. As for iPhone and iPad, this feature does not (yet) exist in iOS Safari when opening new tabs , but you can easily access Private Browsing mode in Safari for iPhone and iPad via the Tabs section. One thing that’s important to remember is that Private Browsing mode is not an anonymous browsing tool or security feature, it just prevents local storage of browsing data under that session. Private Browsing does not offer any anonymity, IP obfuscation, or other capabilities that are typically associated with truly private sessions, like what’s potentially offered through TOR Onion Browser for Mac (or iOS), or a high quality anonymizing VPN service. Option key not required, just right click on my mbp. Same here. Option key not necessary. Just Right Click. The private window trick also works on links in Firefox AND on bookmarks.